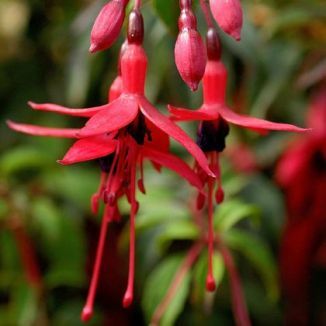 Fuchsia is not easily confused with other wild plants on this web site. All along the roadways of the south-west of Ireland, on slender arching stalks the beautiful Fuchsia flowers colour the hedgerows from July to October with their rich hues. These are deciduous shrubs, only reaching to about 1.5m, which favour coastal locations and rocky ground. The flowers (2cm long) are bell-shaped and have four violet petals which are surrounded by four large, pointed red sepals, rather like a ballerina with a crimson skirt, purple petticoat and long, long, slightly uneven, legs. The grey/green leaves are ovate and toothed and the fruits are black, fleshy berries in autumn. This is not a native plant - is rather the result of planted hedges which have sent out their 'escapes' - but is not regarded as an alien species in the same way as Himalayan Balsam or Japanese Knotweed, having been a familiar sight for a lot longer. It belongs to the family Onagraceae. I first saw this plant growing wild in Derrynane, Co Kerry in the early 1950's and photographed it near Cullenstown, Co Wexford in 2006. 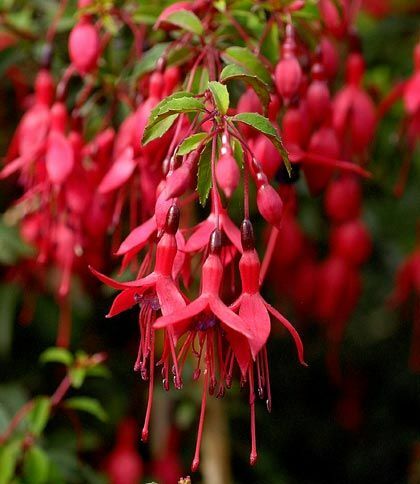 The Fuchsia was named after the German botanist, Leonhart Fuchs (1501-1566) and is a large genus of shrubs which originated mainly in South America. There are very many variations.